Another great day on the water!! It began with sunny skies and calm seas, but into the afternoon the winds picked up and brought some rain clouds. Whales were everywhere (yet again! ), so in the morning the fleet went east to encounter the southern residents. They were seen fishing around the San Juan Islands, spread out through a channel corralling their next catch. We hope they are finding enough prey to sustain the energy needed to thrive! By the afternoon there was a humpback whale and Biggs orca within 900 m from each other right near Race Rocks Ecological reserve!!!! It was incredible to observe so much life in one glance, and crazy to imagine what was taking place below. 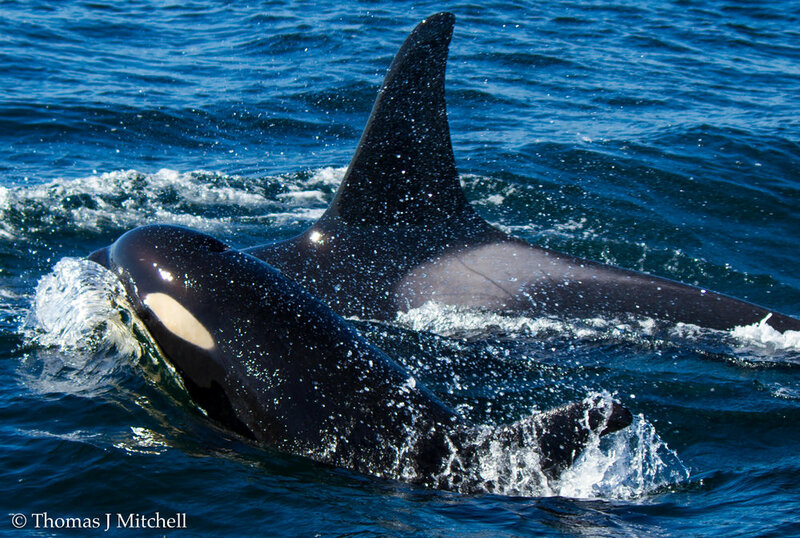 The orca pod was being very active at the surface, after catching their next meal they were seen frolicking through kelp beds and tail slapping!